Kimmy Fasani > Blog > Journal > Kimmy Fasani is awarded 2016 Women’s Rider of the Year! Kimmy Fasani is awarded 2016 Women’s Rider of the Year! Aside from being perhaps the most prestigious form of recognition which exists in snowboarding, Rider of the Year serves as a timestamp on the state of snowboarding during the period for which it is awarded. It is an accolade based on talent primarily but not entirely. The Rider of the Year is someone who is progressing our culture on and off their snowboard. Earning the nod of Rider of the Year forever cements a snowboarder into the history books as a guiding force within snowboarding. 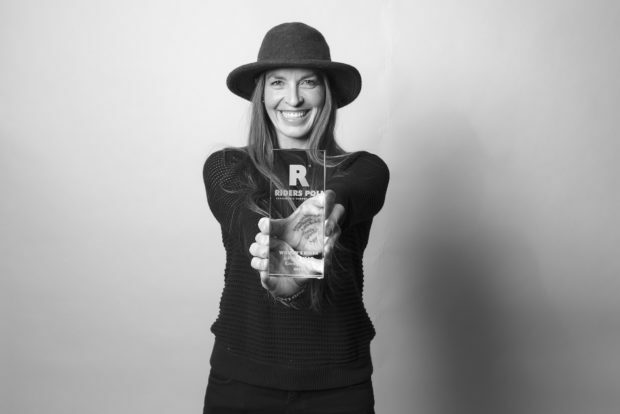 Through her progressive riding and commitment to furthering snowboarding, especially for women, through her events like Amusement Mtn, we’re proud to present Rider of the Year to Kimmy Fasani. Kimmy has consistently pushed the boundaries as a professional snowboarder and earned numerous accolades in our sport, while continuing to push herself and snowboarding as a whole. “Snowboarding makes me happy, and that’s why I keep doing it,” says Kimmy. “Progression happens when I am having fun and feeling the flow of the mountains. I love challenging myself to be uncomfortable, to ride in new places, and to be calm and adaptable. I like the rush and pressure of creating something out of a blank canvas, like snow covered terrain. I continue to snowboard and push myself because I feel most alive and most connected to nature when I am exploring the mountains,” say Fasani.